Modern office space may be leading to a lack of communication between employees. You aim to keep an effective workflow in the office while keeping up the communication between employees for enhanced productivity. Here is a short guide for the effective planning of your office space by making the most of the area you have. 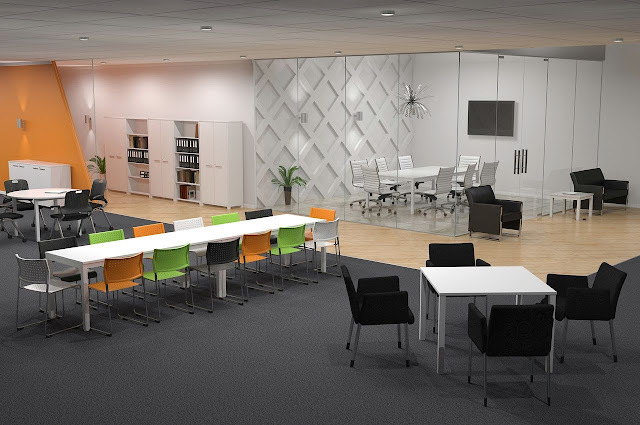 The first section of your office will always be the staff space, followed by support space. The staff space is where your employees work while the support space houses all the equipment and items for support of the staff. Does your office require frequent brainstorming for creative progress? If yes, you must plan in a systematic brainstorm room where teams can sit together for long discussions. As organizations grow, they make up for new space requirement by removing the walls between offices and creating cubicles to incorporate new employees. If you are expanding, consider removing the cubical walls altogether. Employees can be given effective locker space to store personal items, which will help unclutter their workstations. Creating uncluttered workstations enhances productivity and communication between employees. Modern workstations take minimal space on the employee desk. Invest in computers with inbuilt central processing units. The desk should have a keyboard tray for comfort of long hour typing. Allow sharing of telephone between two adjacent workstations for low noise factors. Encourage employees to have informal communication and encourage them to spend fifteen minutes uncluttering their desks. Focus on ergonomics for comfort that will enhance productivity of your employees. Have several meeting spaces in your office, which means your goal should be to provide secluded rooms for progressed interaction between teams. Do not add glass doors and glass walls to the meeting room, as they can be distracting. Allow flexibility of changing the meeting rooms into training rooms. This requires effective pre-planning of furniture placement in these rooms. 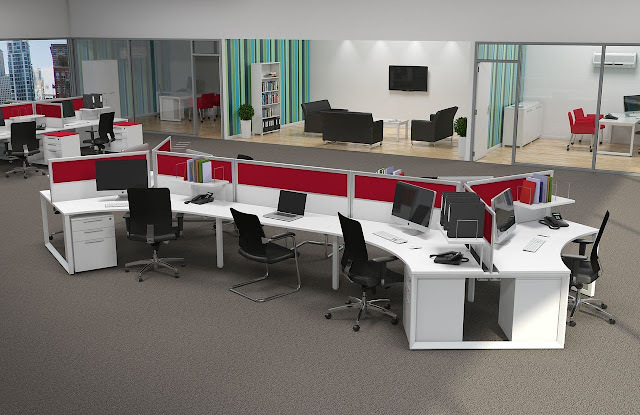 Curved workstations that are combined for several employees are a great method to save space in the office. All files desks, printers, water dispensers should be placed away from these angled workstations. Dedicate one wall of the shared space to file cabinets and lockers for the employees. This encourages neat file storage and paper handling in the office. Your office space should have the ability of environmental control. Flexibility in changing the environment factors such as air, light and temperature should be available to the workers. Adjusting the air-conditioning should be easy. Large glass windows introduce light in the office and keep the employees refreshed. Make the most of daylight to reduce electricity bills in the office. Soft meeting rooms are mainly designed for client meetings. They contain flexible sofas and desks that encourage a friendlier space for discussions. Similarly, open informal rooms are for employee discussions over coffee or light meals. Informal rooms have light use furniture that is innovative and modern at the same time.